I believe that lists, whether they are of names, places, brands or things, are something we will see more of in contemporary literature. Bue. 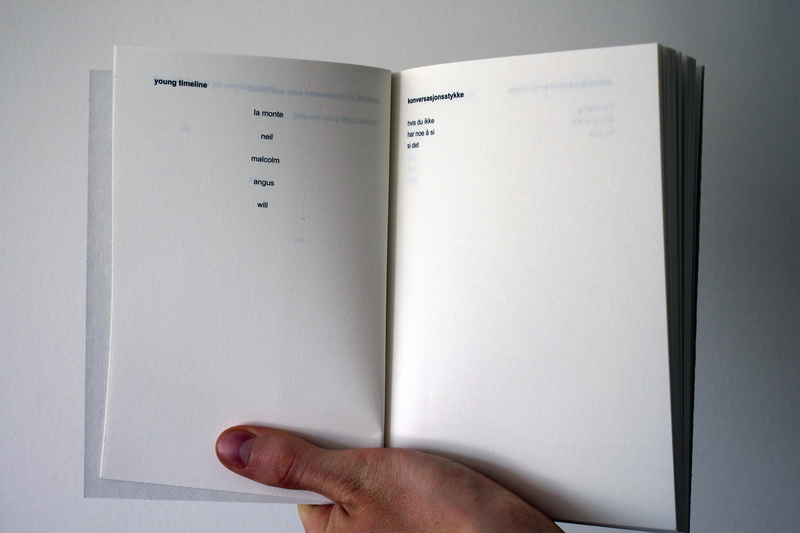 P. Peitsersen, whose work has been reviewed earlier on this blog, also writes lists-poems, such as lists of brands of nail polish. Lists are often highly compressed. A listed item, such as the name ‘James Dean’, carries for most readers a whole host of connotations all contained in a single word. Lists therefore fit nicely with the format of our time, namely the format of Facebook and Twitter messages. These very brief messages demand a high degree of tacit knowledge if they are to convey as much as possible on such limited space. 27 519 tegn med mellemrom is a reference to a quantifiable property of the book itself, somewhat similar to Mortensen’s novel from 2010, titled Roman. The back of 27 519 is pictured below. 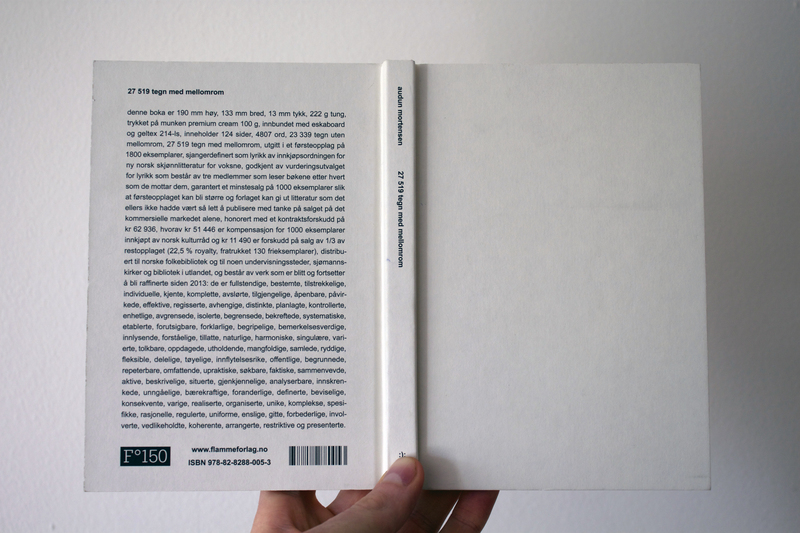 The back states facts such as the number of keystrokes with and without spaces that makes up the book, the number of printed copies, and that Innkjøbsordningen for ny norsk skjønlitteratur has promised to buy 1000 copies and distribute them to schools, libraries, and a few Norwegian Seamen’s Churches (a very generous and to my knowledge unparalleled system that motivates publishers to take chances). All this information on the back cover makes me think about the notion of a ‘quantified self’ coined by Gary Wolf and Kevin Kelly from Wired Magazine. The quantified self is a term for the contemporary practice of keeping track of quantifiable properties of oneself by employing technology such as video, EEG, ECG and wearable computers. 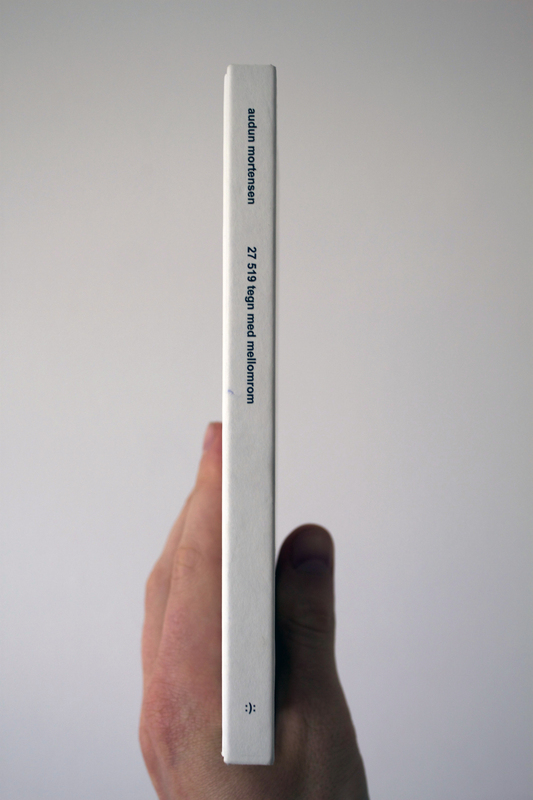 27 519 is conscious of itself, not just as an art work, but as an object with quantifiable properties, exactly like the self-consciousness employed in the quantified self. 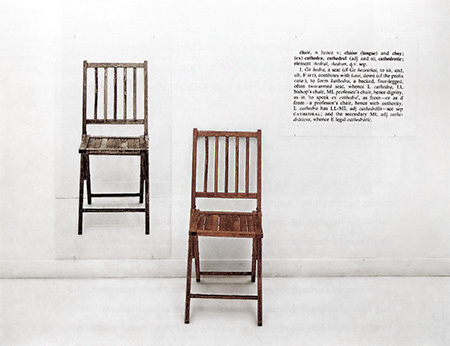 Furthermore it can be seen as an extension of some works of conceptual art from the 60’s in which the definitions of the art work became part and parcel of the art work itself, such as Joseph Kosuth’s One and Three Chairs (1965) depicted below. I find Mortensen’s book to be intelligent, conceptually interesting and fun to read.